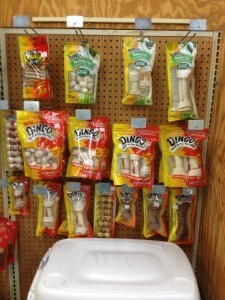 Dingo dog treats are irresistible rawhide chews with Real Meat in the Middle. Lochte Feed carries these treats in a variety of sizes for meet the need of your furry friend. Give one treat every day for full dose of fun and flavor. These dog bones deliver all the benefits of Dingo brand bones like low fat, tasty real meat, high in protien and offer dental benefits. We also carry Dingo Naturals dog treats. Naturals are 100% all-natural rawhide bones with real chicken in the middle for an irresistible taste dogs love! With no artificial flavors, colors or preservatives they’re not only good – they’re good for them, too. Come by today to find all your pet needs at Lochte Feed and General Store. This entry was posted on Monday, March 20th, 2017 at 3:27 pm	and is filed under News & Updates. You can follow any responses to this entry through the RSS 2.0 feed. Both comments and pings are currently closed.